As one of several hundred Polish officers imprisoned at a tumble-down camp in the Soviet Union, Jozef Czapski reached back to his years in Paris as a young artist. From memory, without a single line of Proust to refer to, he crafted a lecture series attended by forty of his comrades after they had finished twelve hours of slave labor, on a near-starvation diet. And the lectures were in French! Two of the officers were so impressed that they asked him to repeat the course so they each could transcribe them, and in 1948 these were translated into Polish and published (only in France, I believe). Not until 1987 were they rendered again in French as Proust contre la déchéance. 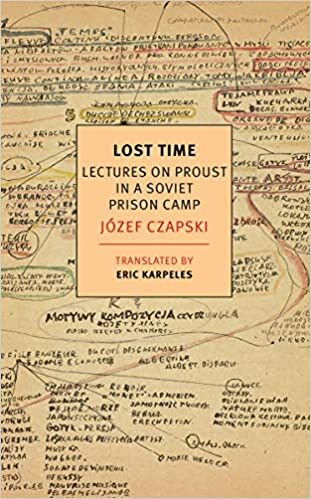 And this version has now been translated into English by the artist and Proust scholar Eric Karpeles under the appropriate title of Lost Time (for what time is more lost than months spent in prison?). 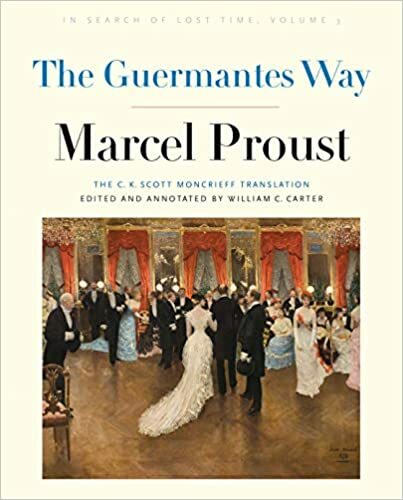 I first regarded it as a tour de force, but it is more than that: a tribute to Proust that is also a replication of Proust's long journey à la recherche du temps perdu. With color plates showing Czapski's sketches and notations, which also miraculously survived the war. In reviewing three books by and about Czapski, Cynthia Haven wrote in the Wall Street Journal: "Once, in his frail final years, a relative found him lying on the floor. He had been unable to get up for hours. She asked how he had occupied himself. Smiling, he hugged her and tried to calm her agitation. 'Oh, no need to worry about me,' he replied. 'I just lay there, perfectly happy, thinking about Proust.'" I ventured onto Swann's Way two or three times before a pal challenged me to read the whole of the novel with him. Every Wednesday on his way to the law office where he was a low-level attorney, he would stop by my rented room (it had a kitchen and bath but wasn't really an apartment). We would drink coffee, smoke(! ), and talk about Proust. Egging each other on in this fashion, we both finished the novel before the year was out. That was the handsome, two-volume Random House edition of the novel, entitled Remembrance of Things Past, the first six books rendered into English by Charles Scott Moncrieff and the seventh by Frederick Blossom. (Scott Moncrieff died before finishing his task, which is probably the reason Penguin decided to employ seven different translators for its 21st century Proust.) When Kilmartin's reworking came out in the 1990s, I acquired that, too, but only read pieces of it—notably book seven, The Past Recaptured, greatly improved over the rather lame Blossom translation. Otherwise, however, Remembrance of Things Past was still hobbled by the post-Victorian prose of Scott Moncrieff. Then came the new Penguin editions, the first four volumes of which have now been published in the U.S. by Viking. After reading a rave review of vol. 2—In the Shadow of Young Girls in Flower—I realized that I would have to read it. On second thought, I decided to start from the beginning with the new Swann's Way. It was a good decision. Lydia Davis did a wonderful job with the first volume, and by the time I'd lulled Little Marcel to sleep (on page 43 in this edition), I knew that I was once again in for the long haul. So I set out to acquire a complete set of hardcover books—not so easy, as matters turned out! I read them in sequence, and I have reported on them here. Mr. Joyce, may I introduce M. Proust? A first cut at comparing the two "Lost Times"
Why doesn't Viking publish the rest of them? In search of Proust: the comix! Beyond that, I've seen it argued that literary French has changed little over the past hundred years, while English most certainly has, under the battering of such writers as James Joyce and Ernest Hemingway. (Whatever you say about Charles Scott Moncrieff, he probably never read Ulysses and he certainly was unfamiliar with the noisy young journalist who stormed into Paris in 1921.) However that may be, it's nice to have a freshened version of Proust's prose, and one that arguably is closer to the original than the one rendered by Scott Moncrieff in the 1920s. Posted May 2019. © 2006-2019 Fallbook Press; all rights reserved.